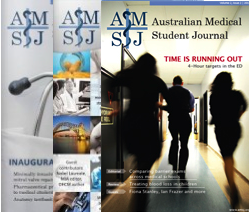 Volume 2, Issue 2 of the Australian Medical Student Journal (AMSJ) is scheduled to be distributed in the coming weeks. This being the journal’s third issue, it is a timely juncture to take stock of the articles published to date, stratifying by factors such as article type, article topic, and author university. The AMSJ has published 86 articles in total: 27 in the inaugural issue, 31 in the second issue, and 28 in the third. The most common article types were review articles (20), feature articles (17), and letters (14) (Figure 1). Figure 2 shows how the proportions of each article type have changed over the three issues. Figure 1: Articles published by type, stratified by issue (n=86). 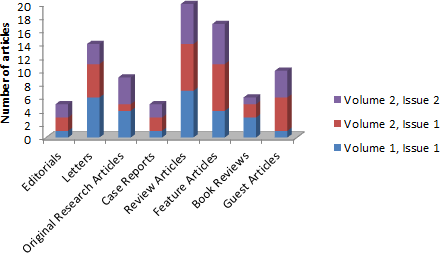 Figure 2: Proportions of article types by issue. 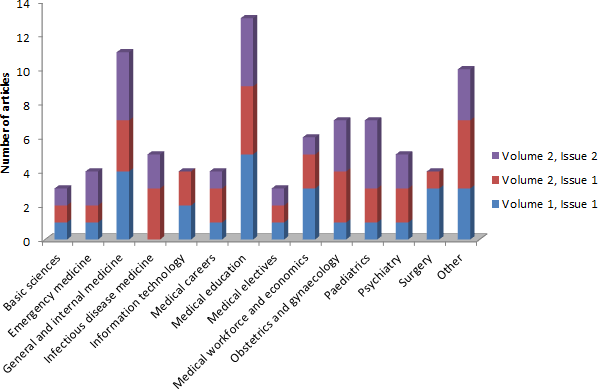 The most common categories of article topic were medical education (13) and general and internal medicine (11) (Figure 3). Figure 3: Articles published by topic, stratified by issue (n=86). Articles have been published by students spanning 18 of Australia’s 20 medical schools (Figures 4 and 5). 14 universities were represented in the inaugural issue, 13 in the second issue, and 14 in the third. Eight universities have been published in all three issues, six have been published in two issues, and four have been published in one issue only. Of the eight universities published in all three issues, six are Group of Eight (Go8) universities. Figure 4: Articles published by author university, stratified by issue. 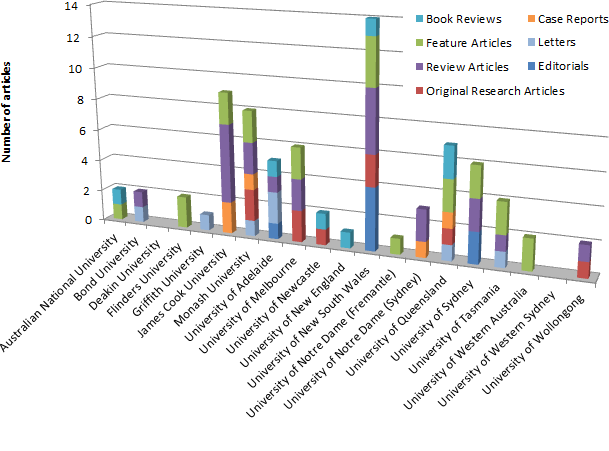 Figure 5: Articles published by author university, stratified by article type. 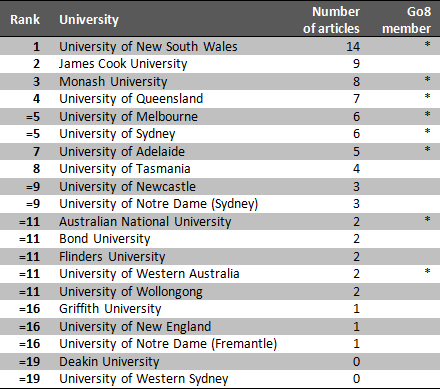 Table 1 ranks the universities by number of articles published. The University of New South Wales (UNSW) has the most number of publications (14), followed by James Cook University (9), Monash University (8), and the University of Queensland (7). Deakin University and the University of Western Sydney are the only not to have been published. The UNSW dominance may be partly explained by the fact that the AMSJ organisation originated from UNSW and may have developed greater brand awareness at that institution. Four of the 14 UNSW articles were editorials. Of the eight universities with the highest tallies, six were Go8 universities (all Go8 universities except the Australian National University and the University of Western Australia). Table 1: The AMSJ League Table, 2011. Australia’s 20 medical schools span all six States plus the Australian Capital Territory. On a State and Territory basis, Queensland has the highest average number of articles published per university (mean 4.75), followed by Victoria (mean 4.67) and New South Wales (mean 4.14). Western Australia has the lowest average (mean 1.5) (Figure 6). 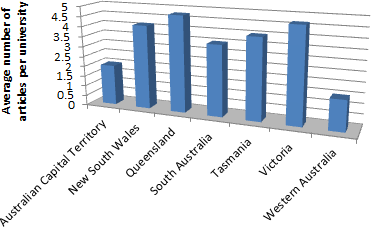 Figure 6: Average number of articles published per university by State or Territory. In 2011, there are 16,553 medical students enrolled across the 20 medical schools. The AMSJ has published 0.005 articles per student enrolled in 2011, or one article per 192 students. The schools have enrolments ranging from 1797 students (Monash University) to 60 students (University of New England). 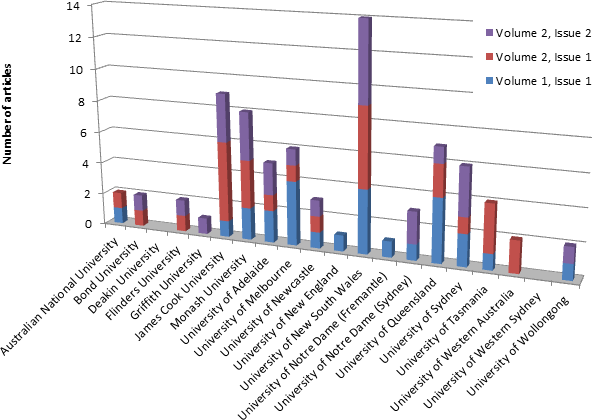 [1,2] Figure 7 shows the relationship between enrolment and number of articles published in the AMSJ. The relationship is highly significant by ANOVA (F1,18, 20.008; p=0.001). It would appear from this that the size of a medical school influences the likelihood that its students will be published in the AMSJ. The number of articles published per capita for each university is shown in Figure 8. 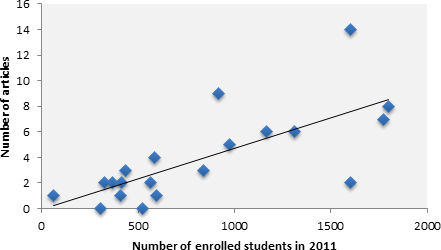 Figure 7: Scatter plot of medical school enrolment [1,2] and number of articles published, with trendline. 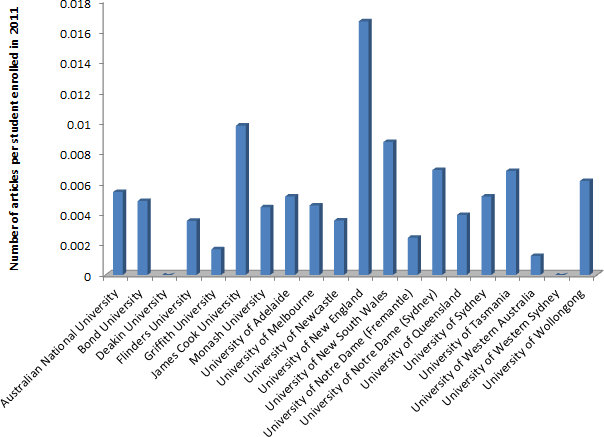 Figure 8: Number of articles published per capita  by university. The Australian Research Council publishes research ratings in eight disciplines for each university. These scores can be averaged for each university to produce an Australian University Research Ranking. 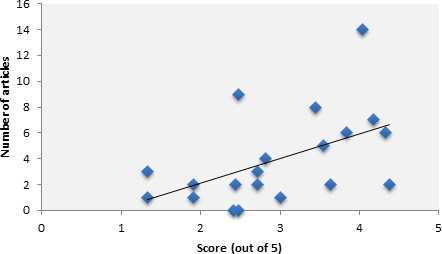 Figure 9 shows the relationship between the 2011 ranking scores and the number of articles published in the AMSJ. The relationship is significant by ANOVA (F1,18, 6.193; p=0.023). It would appear from this that the research intensity of a university influences the likelihood that its medical students will be published in the AMSJ. Figure 9: Scatter plot of Australian University Research Rankings score  and number of articles published, with trendline. 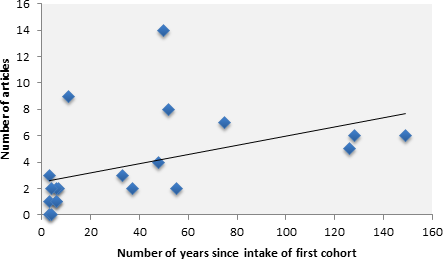 The years in which the medical schools accepted their first cohorts of student span from 1862 (University of Melbourne) to 2008 (Deakin University, Notre Dame University Sydney, and University of New England). [4,5] Figure 10 shows the relationship between medical school age and the number of articles published in the AMSJ. The relationship is significant by ANOVA (F1,18, 4.667; p=0.044). It would appear from this that the age of establishment of a medical school influences the likelihood that its students will be published in the AMSJ. Figure 10: Scatter plot of medical school age [4,5] and number of articles published, with trendline. 110 authors have been published in the AMSJ. Eight of these have published two articles (including four AMSJ editors), while the remaining 102 have published one. The AMSJ only accepts articles where the primary author is a current university student or medical intern, or where the primary author’s research was largely conducted whilst a university student. The exceptions to this rule are letters and solicited articles. 83 (75.5%) of the AMSJ’s authors were classified as students, while 27 (24.5%) were non-students. Of the non-student authors, eight were letter authors, seven were co-authors with a student as the primary author, and twelve were solicited by the AMSJ. These include three Australians of the Year (Patrick McGorry, Fiona Stanley, and Ian Frazer), a Nobel laureate (Peter Doherty), two Australian federal politicians (Kevin Rudd and Nicola Roxon), and three prominent medical authors (Nicholas Talley, John Murtagh, and Murray Longmore). What is the purpose of analysing all of this data? As the national journal for medical students, the AMSJ would like to see representation and contribution from all of our medical schools. Hopefully, we can encourage a friendly rivalry between schools and in doing so, increase awareness of the AMSJ and the number and quality of submissions. Since its establishment in mid-2009 and the release of its inaugural issue in April 2010, the AMSJ has become a truly national publication. It has a staff of around 50 students, spanning all 20 medical schools. It has published articles by students from 18 medical schools and distributes to more than 10,000 students per issue via both print and electronic editions. This is an impressive presence that the AMSJ will try to build upon going forward. Lawson KA, Armstrong RM, Van Der Weyden MB. A sea change in Australian medical education. Med J Aust 1998;169(11/12):653-8. Lawson KA, Chew M, Van Der Weyden MB. The new Australian medical schools: daring to be different. Med J Aust 2004;181(11/12):662-6.